Welcome to Glowcare, Glow Worm approved and accredited service agents, for the North West of England, since 1992. Glowcare are Glow Worm Swiftflow combi boiler specialists. We have been repairing and servicing the Swiftflow 75, 80, 100 & 120 models, since the boiler was launched at the start of the 1990’s. We provide expert Swiftflow repair and service for our customers throughout the Greater Manchester, Cheshire, Liverpool & Lancashire areas. We also serve many other towns and cities across the region. Over the last 20 years, Glowcare have attended and repaired many hundreds of broken down Glow Worm Swiftflow boilers. Typical faults being: noisy & broken fans, PCB faults & failure, intermittent pilot outage, leaking boiler expansion vessels and other pressure loss problems. As you would expect, we carry a full and comprehensive van stock of all major Glow Worm Swiftflow parts and spares. This ensures that we are almost always able to restore the heating or hot water in just one single service call. To check that we cover the area where you live, please see our Areas We Cover page, and click on your nearest town. Please also view our Customer Testimonials page, to see how our service is rated by our customers. 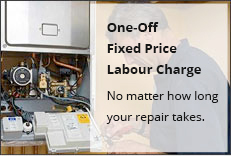 Contact Us today for our one-off, affordable fixed labour price, for your Glow Worm Swiftflow boiler repair or service.